Welcome to the first in our series of Q&A’s with our Food Tour Pros students and food tour operators from around the world. We’ll be going in-depth to learn about their experience in starting a business and being involved in local tourism. Without further adieu, jump into our first Q&A session with Erin Eubank, owner of Taste of Catalina Food Tours on Catalina Island. 1. Tell us a little about Taste of Catalina Food Tours. Taste of Catalina Food Tours was born in the Fall of 2012. There is an annual event called the Taste Around of Avalon. It takes place on the Thursday that kicks off Flying Fish Festival Weekend (May 28, 2015). During this event, participants pay $1 per taste and get to visit different locations throughout Avalon while voting on their favorites. I love the event and thought it would be great to have something similar take place every day. I had been on a couple of food tours and found the mix of edibles, history, and architecture to be a culturally descriptive way to get to know a new city or community. I knew people would love learning about the food and facts that make up the story of Catalina Island. 2. What were you doing before you started a food tour and why did you decide to take the leap? Life was pretty busy before I started the new business. We (my husband Gene & I) own and operate Catalina Coffee & Cookie Co. When I started the food tour company, we were entering our 10th year as owners (the shop had been in existence previously for 20 years) so it has quite a following of locals and visitors. I also was an Innkeeper at the Inn on Mt. Ada, the former summer residence of the Wrigley Family (of chewing gum and Chicago Cubs fame). I guess you could say I was a glutton for punishment. With two of my three boys heading off to college and the ownership of the Inn changing hands, I knew I would have some additional time to invest. I decided to take the leap because I knew it would work. We have a great community of restaurants – the families behind them equally phenomenal – this would contribute to making it a successful venture. I would provide new jobs, work for myself and others in our town. It just made sense. Not to mention a new, exciting way to explore visiting Catalina Island. 3. What was the biggest challenge in starting your business? How did you work through it? The hardest part was making the decision to jump into a new venture. It doesn’t take a lot of capital to start a new food tour, but what it does require is carving out the time to set yourself up for success. First, take the Food Tour Pros Course, it will propel you forward so much faster than the trial and error you would be going through trying to test things out to see if they work, etc. Second, give yourself three months to set everything up including contacting the vendors, making the route, building your website and gathering facts and stories for your script. Third and last, follow through, follow through and learn your script inside and out. Repeat over and over and over. Once it gets going the biggest challenge that faces you is exposure, so get your hands on those free “Review Us” Trip Advisor cards, hand them out like crazy to each tour guest and gather their emails to ask for reviews as a follow up. SEO is the biggest challenge online. The fastest way through that is genuine reviews on trip advisor that will boost your visibility quickly on their site until your website is around longer and gains momentum on the web. 4. How has your life changed since you started Taste of Catalina Food Tours? I am now working full time for just my businesses, which is nice to be truly my own boss and not be focused elsewhere for someone else! We are gearing up for our third summer season, with tours running every day of the week. We are kicking off our new Catalina Happy Hour Tour, which I personally guide. We are also in the process of building a 3rd tour which we are hoping to be self guided scavenger hunt that is food focused. I know sounds awesome, huh? It may premier as early as Summer of this year. 5. What’s the most rewarding part about running a food tour business? Since I am an entrepreneur at heart, I love creating something and seeing it grow out of virtually nothing. The most rewarding part is getting feedback from guests, via comments in person, reviews online and through return guests. The idea that I had is being validated every day. The hard work, effort and time are paying off. I am also very proud that we have a team that are committed to seeing the business grow and continue to thrive. Our guides are amazing and it is wonderful when they receive praise from our guests because of the time and effort they have invested. 6. What advice would you give to someone who’s thinking about starting a food tour in their own city? Go for it! Food is a fantastic way to get to know a town. Take the Food Tour Pros course – it saves you learning curves, growing pains and money in the long run. Have a core group of friends or co-workers be your sounding board. Make sure they are a diverse group so you get an accurate, yet wide-reaching point of view when you are in the development and test phases. Don’t be afraid to ask for something more from your vendors. The worst thing they can say is no. Be confident in your knowledge about the area. HAC can be a challenge to develop, but if you know your resources (museums, local historians, local library), you will be on your way quickly. 7. What makes Catalina Island a culinary destination? Catalina has been a culinary destination for years, but it manages to fly under the radar of most “foodies.” We feature our tour as introducing you to the local favorites, offering some items that are off the menu, dining like a local dines…not necessarily gourmet/culinary/stuck up foodie, if you know what I mean. However, fresh, locally caught fish is the biggest draw – swordfish, yellowtail, halibut, and sand dabs are at the top of this list. You can get your fish of choice grilled, blackened, in a taco, or on a skewer – it’s all amazing! There are a number of cooks and chefs who have been here for years, creating delicious, consistently flavorful food at places like Steve’s Steakhouse and the Lobster Trap. There are also a number of up-and-coming locations that provide something new – Bluewater Avalon, Seaport Bistro, and pop-up event location The M by Zest – are just a few. The great thing is for a town that is so small, there is a wide variety of options for nearly every type of diner. 8. What do you think your tours have added to the culture and community of Catalina Island? I think we add a page in the story that is not often told. We have had long-time visitors and residents come on tour who have even learned something new! Imagine living in a town all your life and suddenly learning about new connections between businesses and families or previously unshared historical facts. We strive to make our tour as friendly (and non-touristy) as possible. We are creating an intimate and personal way to get to know Catalina Island and Avalon. This is a unique experience, as most everyone doesn’t want to be known as a tourist visiting a new town! Most visitors want the inside scoop and the local low-down, which is what we provide. I also think we’ve proven that food is a great avenue to get to know a place. Avalon has a Restaurant Week now (this year is the 3rd annual – May 29th thru June 4th) and we were huge supporters to get that started. People now come to the island specifically for a food-driven events, which helps every business – not just ours. 9. What’s the number one feedback you get from tourists (and locals) who go on your tours? Taking the tour the first day you are in town has been our number one response from guests. It sets you up for success in choosing places you will visit during the rest of your time on Catalina. We also have guides that are very knowledgeable on the activities and events around town, so you may find out about a special event or get some insider information that will help make the most of your time in Avalon. Even some of the locals that have taken our tour ate something new that they didn’t know the location they have frequented for years offered. Everyone is pleasantly surprised at how much food and beverage is offered. 10. What qualities or characteristics help make a great Food Tour owner? Have an idea, follow through on it, setting high standards for all that you choose to involve with you. Yes, that’s right, they get to be involved with you!!! For instance, you can only have so many locations on tour, do they make the cut to be one of the 6 locations on tour? Be uber flexible and surround yourself with great people to work with you and for you. Involve your friends on your mock tours so you can get great feedback and even better ideas to use as well. Have stick-to-it-ness, a great personality and the ability to persuade restaurants to think outside of their box. 11. What makes owning a Food Tour Business unique or special? Owning a food tour business is unique because we get to integrate ourselves into the restaurant/foodie scene in a special way. We string the businesses together in a way that no one realizes by tying the tastes together to make an amazing progressive meal. Who knew that tasting around town could be so involved and yet we make it look like a breeze! We know this because our guests usually say so! For instance, we are looking forward to our new museum opening later this year. We hope to bring the restaurants in on making unique food and drink offerings that correspond with the latest exhibit being featured just right up the street. (The museum rotates their main exhibit quarterly, so we think 4 times a year is not too much to ask.) Being in this industry is a blast, it’s what you make of it! 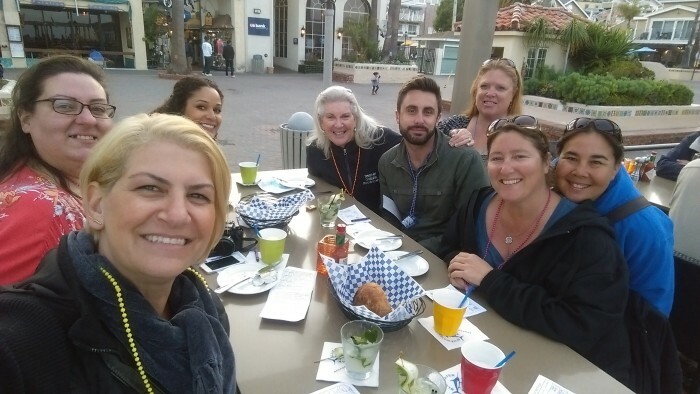 For more information about Taste of Catalina Food Tours you can visit their website at www.catalinafoodtours.com and be sure to follow them on Twitter @CatalinaFoodie where they’re always sharing fun photos and updates from Catalina. I went on the tour last year, the food was great and the tour guide was so nice and knowledgeable. Every place we stopped for a taste was superb, every one better than the last!!! !